The images are Stanford University Proof of High PPM of Atomic Silver Particles inside of nanoparticles; they can be hundreds of thousands and maybe even millions of atoms(depending on the size of the nanoparticle). Our process breaks down the particles into individual Atoms. The atoms are attached to the H20 water molecules forming H20 with atomic particle clusters of silver, gold or whatever element is applied. It MUST be understood: Only Major Universities and Government institutions with Multi-million Dollar equipment have been able to produce nanoparticles smaller than 2 nm. Companies that claim to do so may be using data from such sources and claim to have it as their own. To detect Atomic Particles in distilled water are not visible to the naked eye, and do no produce "colored solutions." The wavelength of visible light is about 10-6 microns. The size of a typical atom is about 10-10 m, which is 10,000 times smaller than the wavelength of light. Since atoms are extremely small (far smaller than the wavelengths of visible light), they’re much too small to reflect light in a silver solution and cannot even be seen with optical microscopes., they have to be made into larger particles that can be measured. To accomplish this assignment, a Destructive Test has to be implemented in which the solution will no longer be the same as it originally was before the destructive test was applied. The use of a Plasma Arc ICP Spectrometer was employed to do this test; it emits a plasma flame into the solution so that a transformation of atomic particles to ionic particles as well as some evaporation occurs and are converted and counted as nanoparticles. This process then enables the nanoparticles to be measured and calculated. However, because the Plasma Arc also causes the solution to evaporate, and the atomic particles are attached to the water molecules, the process causes an enormous loss of PPM that cannot be accounted for because atomic particles also evaporated into the air along with the water molecules. Interestingly, if you were to evaporate very slowly to half of the solution where the evaporation process is not violent or destructive, the PPM will double. The above explains why the Plasma Arc ICP Spectrometer process is not completely an accurate process for proving Atomic Particle PPM or particle size, but it comes fairly close, there is is no known method to count atomic particles in distilled water. When you read the report, it will show a low PPM of 100 nm and under, those are some of the atoms that were fused together into nanoparticles, the good thing is that this reports confirm metal content and confirms our reading of High PPM. We have recently found out that testing facilities prohibit the public display of their Laboratory Test Results since they do not want to appear as to endorsing a product. They have asked us to remove their name, logo and company information since it is a violation of their terms and conditions. Atomic Particles are measured in Angstroms and the silver atomic particle is smaller than an Angstrom, An Angstrom would equal 0.1 nm, that would be one dot from the pictures shown above from Stanford University. 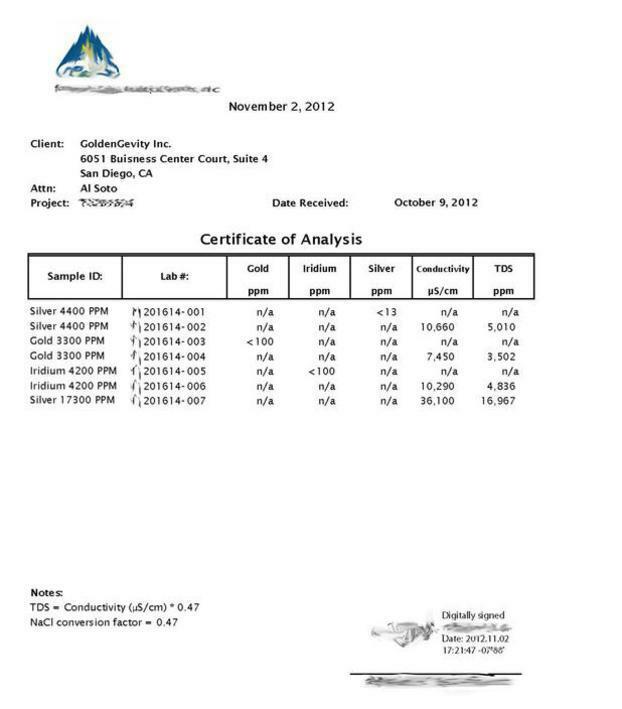 Looking at the report, you will find the element Iridium. Iridium is one of the hardest elements on Earth, yet we were able to make a High PPM concentration of Iridium Atomic Particles Suspended in Distilled Water, they are not just any atomic particles, they are in fact monatomic, with a reverse spin of normal Iridium Atoms! This fact alone is remarkable by itself since we are not LIMITED and BOXED INTO only selling one kind of product as many others are. The fact that our products are so pure enables us to mix and match different blends of noble metal elements without spoilage and without fear of chemical side effects. Please See the Atoms vs. Nanos page find out more about the specifics of atoms and ions. Also, see Atoms Theory web page to see why colloidal noble metal atoms make sense. • The High PPM Value that proved verified with their a TDS Meter. •The metals described with the High PPM were detected, and converted into nanoparticles. • If we say, it has gold, It HAS GOLD! • If we say it has Silver, IT HAS SILVER! • If we say, NO Chemicals are used or added that Means NO Chemicals are Used or Added! This Chemical free process reduces the risks of side effects that have been associated with dangerous nanoparticle and Ionic silver products. Atomic Particle Colloidal Silver does Produce a Tyndall Effect as shown in the video to the left. Because the millions Silver Atoms are attached to the Water Molecules, make the water molecules more easily detectable with the TDS meter. To be able to produce the Tyndall Effect of atomic particle colloidal silver, there would have to be Billions, maybe even Trillions of Atomic Particles and there are. This also alone proves Silver Content as well as non-Ionic composition in the most simple way. The video shows you how super saturated the Colloidal Silver is with atomic particles. Producers of Ionic and Nanoparticle solutions do not have the equipment, experience or scientific know how to make atomic sized particles. This makes them feel uneasy as they can't explain the reason our products DO what theirs CANNOT DO. They attempt to discredit or undervalue all rival products by conducting their “In-House” laboratory tests. They claim to have millions of dollars in laboratory equipment, but that does not mean that they are correct or unbiased in their conclusions. Some producers of Low PPM products have been in denial for decades; they thought that the nanoparticles solutions they produced were nanoparticle products, until they read the Rice University Report that found ionic particles in their solutions. They have recently started to change their mantra based on that report, and now admit that they "too" have ionic particles to some degree. The Rice University did studies and concluded that it's the Ions that produce the positive results and not the nanoparticles. Bear in mind that while Ionic Particles are the reason for nanoparticles limited success, they are not without issues of their own. Ionic particles are unstable and can only be made via a chemical process when it comes down to producing Ionic Silver, Read more about Ions here. The Rice Universities Report Concludes "...Rice researchers settle a long-standing controversy on the mechanism by which silver nanoparticles kill bacteria – and they find that using too little can help bacteria build immunity... " which confirms why High PPM of Atomic Particles of Colloidal Silver is the BEST CHOICE especially since atomic particles are smaller than IONS. does not mean it cannot be done"